The following nformation was shared by several cake artist; it is really hard to figure exactly where the English overpiping really began; we know in Europe. There are many extraordinary cake artist who authored books on overpiping in the late 1800’s. If you have any other information you would like to share on the history, please contact Kathleen. Thank you! European overpiping techniques were first thought to have developed in Italy, then lost to France, then lost to Germany and then to the UK; they call the style English overpipng. A gentlemen by the name of Secunda Pietro Borella, born in Italy in 1864; he was married to Annie Maria from Cheltenham, Gloucestershire and had a son by the name of Guiseppe and a daughter Stella. S.P. 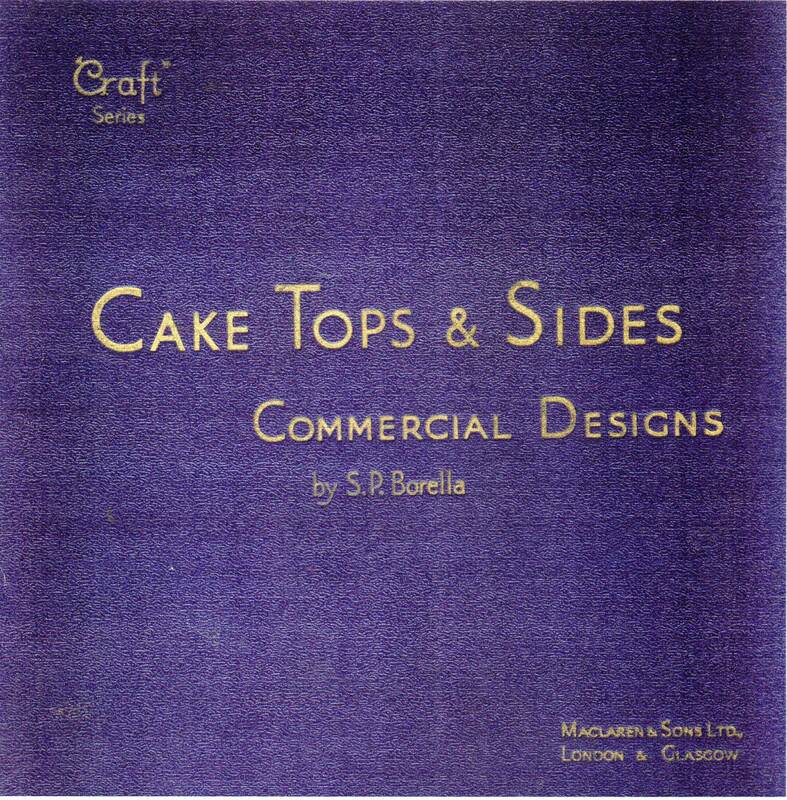 Borella wrote one of the first books on European cake decorating techniques in 1901 and passed away while living in Hendon, London October 1939; at the age of 75. Cake Decorating and embellishments were handed down from generation to generation European bakeries, since the beginning of cake decorating. There have been many cake design artist throughout Europe, adding their own flair and styles to English overpiping techniques. The Lambeth Method became popular when Joseph Lambeth visited from the United States and was a constant competitor and successful award winner at the International Food and Confectionery Exposition of London, and Provinces, Great Britain, for a period of 12 years. He won several Gold and Silver medals, diplomas and awards. Joseph Lambeth moved from the United States, starting a pastry school in England called the Lambeth Decorating School. Lambeth popularized English overpiping by add his own flair; he did not invent the method. Joseph Lambeth published a book called the” Lambeth Method of Cake Decorating and Practical Pastries,” first published in 1934. Some of the pictures in the book were also done by Mrs. Joseph Lambeth the ninth and last printing of his book was in 1980. 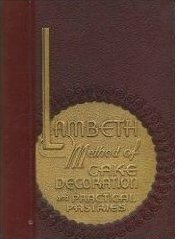 The Lambeth Method was not only used in competition, Joseph Lambeth used buttercream frosted and decorated cakes in a lot of his designs. In the Lambeth Method Cake Decorating book, he explains making royal icing baskets, flowers, run sugar plaques gum paste and pastillage structures ahead of time, to be used and place on cakes when receiving orders from a customer. The English overpiping techniques require a lot of practice, pressure control and precision. This method requires repetition in which gives any cake design artist precision and the ability to do any design in frosting; an ultimate challenge for a piping cake design artist. 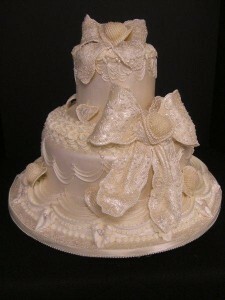 There are several different distinguished forms of cake design artistry using many different piping techniques; Australian, South African and Nirvana to name a few. All design work was done with egg white royal icing; true precision and piping techniques. 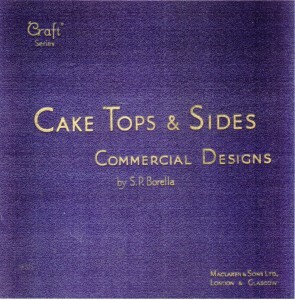 A true cake design artist should know how work with all the mediums in cake decorating / confectionery arts and add their own modernized versions and styles to the older style techniques; this will allow cake decorating to progress throughout the coming years and add interest to more distinguished old school styles, while keeping the traditions of older techniques alive. Since Kathleen Lange attending her very first cake decorating January 1980, the Lambeth Method was one of her all-time favorite techniques in cake decorating. She was always intrigued by the dimensional work and challenge of precision; and very fortunate to be one of the very few to have studied extensively with world renowned Hall-of-Fame Decorator Betty Newman-May. Kathleen completed a 150-hour course known as the “Lambeth Method” Master Course of cake decorating; the most unique international method of cake decorating around today..
Today, Kathleen is a highly regarded innovator and is known internationally for the foreign technique, The Lambeth Method. She has brought back an old school technique by adding her own techniques as well as a contemporary, romanticized and modernized flair. Kathleen has become very well known instructor, teaching her famous Lange/Lambeth Boot Camps, skills in confectionery sugar art and also the quality of her demonstrations and classes. Kathleen inspires enthusiasm in everyone who attends. 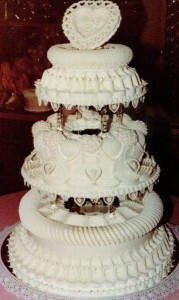 L PIcture – Lambeth Wedding Cake,1984- Katheen’s Final Cake after attending Betty Newman- May’s 150 hour class. R PIcture-“Victorian Elegance -2009 Kathleen used her own style and techniques to add a contemporary, romanticized and modernized flair to Old School Lambeth Method. The following names are famous confectionery artist, since the late 1800’s who have contributed to the art of royal icing by creating new designs and techniques to share their art of cake decorating with sugar artist all over the world. Personally, all decorating has started by being inspired by nature, antiques, life like previous works of art and for new techniques to become more modern “New” Artist add their own flairs, becoming a “New Style & Flair” of “Old School” techniques. We apologize if we have missed listing anyone’s name or information. If so, please Contact Us, Kathleen at Confectionary Chalet to add your information. To the best of Christine Flinn’s knowledge, the main creators of all the piping techniques we use today stem from Herr Willy, Edwin Shur, Ernest Schulbe, George Cox, S.P. Borella- everyone thereafter could in theory be classified as a copier. Edwin Schur- based Putney, a district of South West London (his son Fred piped Queen Elizabeths wedding cake 1954) wrote at least one book 1901? Colin Burge – based in London?